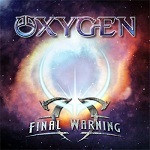 Oxygen are from Sweden that excel in high quality Melodic Rock with an 80’s tinge. Tony Niva began his musical career 1987 with a metal act called Zanity. They only recorded one demo-tape which was never to be released for the public masses. Tony also appeared on the single Down Town released with Swedish Erotica somewhere around 1988. After the sessions in Gothenburg Tony was a member in several musical acts around on his home ground regions, such as Malibu Band, Tracy Goes Crazy and Axia. The band NIVA released “No Capitulation” in Japan in 1994. After this first NIVA release there was not much activity in terms of live performances, instead Tony composed own made material during that period. At that point Tony was moving his musical direction from the metal genre. He made an appearance with the band Lion’s Share and they released the album “Entrance”. Niva have now changed their musical prowess to more of the AOR and Melodic Rock style of direction, the new band is called Oxygen and the album is “Final Warning”. What this album is all about is highly infectious melodies and great songs. Oxygen have a knack of turning out great tunes, in the manner of Treat and such other great Swedish bands but they seem to have captured that great American / Canadian vibe of the early eighties, and vocally Tony sounds a little like Lou Nadeau of “Wrabit” so you can be sure they stand out from the crowd! Oxygen are like a breath of fresh air and they put so much passion into their songs, this fantastic album should be a big hit with all those who love Scandinavian Melodic rock but also love how it was originally done in the 80’s on the other side of the Atlantic.